Since I have been editing and revising my novel The Mediterranean Source (working title), I have been mentally travelling back to Menorca every day. And it’s been amazing. Almost like a mental holiday. It just seriously beds in the fact that I would love to live on that incredible little island one day. My husband knows how much I want to spend some time there, and you never know – if we win lotto – perhaps I might just get there to live for a wee while in a little cottage on the coast and spend a few months writing. What amazes me though, is that this island is a hidden gem in the great scheme of things. It is not a tourist destination, even though its neighboring islands are. One island is the party island of the Mediterranean, and the other is a place where lots of sun-starved British people go to get a little bit of Vitamin D.
I know that once I finish all the revisions on this book that I will once again be sad about leaving this treasured island. I remember when I first finished writing it years ago – I got really upset. I missed my characters, and I missed the island. Thankfully, I launched into work on another her book within a matter of weeks to distract me, but there is something about this story of wreck-diving in a serene and beautiful place that warms my heart. I think that when it comes to writing, setting the scene is so amazingly important. For me as a reader, and as a writer – this is the core element that makes the story real for me. If I can walk down the cobbled streets of Mao/Mahon in my mind with the characters, that brings the story right to the forefront of my mind, and I become completely immersed. I think that as a reader I need this imagery… and as a writer – I like to provide it. I’m not far away from finishing the revisions and edits of this book. A part of me does not want to ever let it go. I don’t know why, it’s just the way I feel about it. This isn’t even the first book I have written, and nor do I consider it my ‘baby’. But there is something about the characters and the place in time that they exist in. 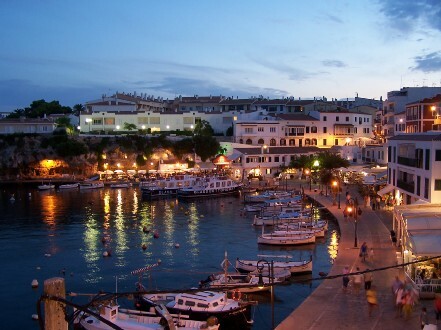 Menorca Island is a dream for me. A place discovered by the spin of the globe. The characters were created from my mind, and they have developed into such a realistic fruition, that I am going to find it hard to let them go off on their own publishing journey. These characters are so different from each other. They all have lead very different lives, and experienced different things. But they all have something in common – the love of beauty and life. They just see it differently from one another. I was actually going to blog about something totally different today… but as I was sitting here thinking about The Mediterranean Source, I started reminiscing about the book, the story, and my character’s lives. This is a special story that is close to my heart, as it is the book I wrote after a close friend died in a diving accident. Maybe that is the reason why I never really want to let this book go. But as my friend Tee says – the first draft is the writer’s own. The other drafts are for the readers. Aw, thank you Tee! I certainly hope so! Great post 🙂 I totally want to go to that island now! And they are such lovely havens for all of us. This is why people read a book – to escape to another place within the pages. Perhaps this is exactly why we write as well. Love the post hun 🙂 But then you know how biased I am about the Mediterranean. Mental vacations any time, Kimmi 🙂 I’m pretty glad that I decided to blog on this too. I was tapping away at it, writing it into an email at work, and my boss had to remind me about a meeting – I was that absorbed. But I am going to miss it. No doubt about it – but I guess that this is just a journey that we all must walk sometimes. After reading your novel, I totally wanted to go there!!! After reading your post, I can’t wait until this book is published. Your passion for the island and the love you have for your characters is exciting to see as a reader. Hope to see it on the bookshelves one day soon. Aw Anna! You are definitely one of the first people on my reading list as soon as I finish it up. And since you have been there a multitude of times, your knowledge will be invaluable! So – thank you in advance for your time and commitment to helping me finish this story up. Much love!